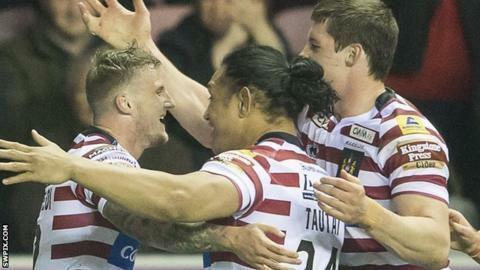 Dom Manfredi scored a second hat-trick in a week to maintain Wigan's 100% home record in a 30-20 win over Warrington. It capped a memorable Wigan night, who had Ben Flower back after a six-month ban, and announced Sam Tomkins' return. Warrington led with Joel Monaghan and Chris Bridge tries, but Liam Farrell, Ryan Hampshire and Manfredi crossed to establish a 16-14 lead. Wolves' Ben Currie went in after the break but Anthony Gelling and Manfredi scores built up an unassailable lead. Manfredi, 21, who also notched a treble against Catalans on Sunday, now has nine tries for the season. Having returned to winning ways in convincing fashion against Wakefield on Saturday, Warrington's loss is their fifth in six games but they started the brighter. Flower was met with a resounding reception by the Wigan fans on his return after a six-month ban. Early tries from Monaghan and Bridge exposed space on the Wigan left, but a rapid response from Wigan on the back of smart work by George Williams got Farrell and Hampshire in. Flower, who had been banned after punching St Helens' Lance Hohaia in the 2014 Grand Final, received a resounding reception from the home supporters. But he was given an early reminder of Super League intensity by Wolves back-rower Ben Harrison's shuddering hit. The third Warriors try, courtesy of marvellous skill by Joel Tomkins and Gelling, gave the home side the perfect lift going into the half-time announcement that Sam Tomkins would be returning to the DW from 2016 after two seasons with New Zealand Warriors in the NRL. There was no standing on ceremony from Warrington after the break as Currie powered through a gap to go over, before the pendulum swung back as Gelling found his way in. Manfredi spun his way across on the back of a classic Wigan shape to the right, and then notched his hat-trick when Gelling's kick kept the ball alive to give Wigan a 10-point buffer they had no trouble in defending as Warrington tired. Wigan coach Shaun Wane on Ben Flower's return: "I thought he looked a bit serious, he's not done anything for six months. "I was a bit apprehensive for him but I thought he played really well - he belted a few people - and he led the song in the dressing room. "It's good to have him back. He's been vilified in the press but he's a really nice bloke." Wane on Sam Tomkins: "Everything is great. It's fantastic getting these players back. We should be very proud. It's a great coup for us, it just shows we do some things right." Wane on the game: "It was a bit of tick and pass at times, which is disappointing, but I thought our attack was good. "We gifted them a couple of tries with poor one-on-one misses but it was win at all costs for us and we got the win. "Competition is driving up the skill levels and we're going to get better. We are going to put a real complete performance in soon." Warrington coach Tony Smith: "It was a great effort by both teams and another great game. We produce some of the best games between us but, at the moment, we're coming out on the wrong side of them. "I think both coaches will be looking for some improvement in defence but some special rugby league was played. Sometimes you've just got to go 'wow', it's pretty hard to stop if they are going to go to those lengths to score tries. "The start of the second half really hurt us, it sapped our energy when they were throwing the ball around like a basketball. The second half wasn't great for us but we're heading in the right sort of directions. "It takes good performances to beat us. We're much better than a few weeks ago." Wigan: Hampshire; Manfredi, Gelling, Sarginson, Burgess; Williams, Smith, Mossop, McIlorum, Crosby, J. Tomkins, L. Farrell, Bateman. Warrington: Ratchford; Monaghan, Bridge, T. King, Ormsby; Patton, Myler; Hill, Higham, Asotasi, Currie, Westwood, Harrison.